Ukrainian President Petro Poroshenko took centre stage at today’s (30 August) EU summit and said that the Union’s heads of state and government had given his country broad support, since it had faced “open aggression” from Russia, adding that the EU’s agenda from now on would largely revolve around Ukraine. Poroshenko was invited to speak at the summit, which was initially intended only to decide the successors of Council President Herman Van Rompuy and EU foreign affairs chief Catherine Ashton. Soon after Poroshenko took the floor, EU leaders elected Polish Prime Minister Donald Tusk as Council President, and appointed Italian Foreign Minister Federica Mogherini as High Representative for Foreign Affairs and Security. They will take over when the mandate of the current holders expires later this year. According to information obtained by EURACTIV, Ukraine lobbied hard to obtain Poroshenko’s participation at the summit. Initially it was planned that the Ukrainian President would only meet bilaterally with EU leaders during his visit, which coincided with the Brussels summit. After Russia stepped up its aggression on 26 August, it became clear yesterday that Poroshenko would have the chance to address EU leaders at the summit. Although the exact content of his message is not public, sources said that the Ukrainian President insisted on stronger EU sanctions against Russia, as this punitive measure is said to be the only one that could make the Russian leadership think twice in its push to destabilise the neighbouring country. As his Brussels visit was ongoing, media reported that Russian tanks had entered the small Ukrainian town of Novosvitlivka on the border with Russia, firing on every house and, flattening the town. “Ukraine now is subject to foreign military aggression and terror,” Poroshenko said, appearing in front of the press alongside Commission President José Manuel Barroso. He said the situation had worsened since 27 August (see background) and that thousands of Russian troops and tanks were now on Ukrainian territory. Barroso agreed that the situation had worsened considerably. “We may see a situation where we reach the point of no return,” he said, “if the escalation of the conflict continues.” Barroso added. Asked later by journalists what a “point of no return” may mean, Poroshenko said this was full-scale war, which was already taking place in the territory controlled by the pro-Russia separatists. 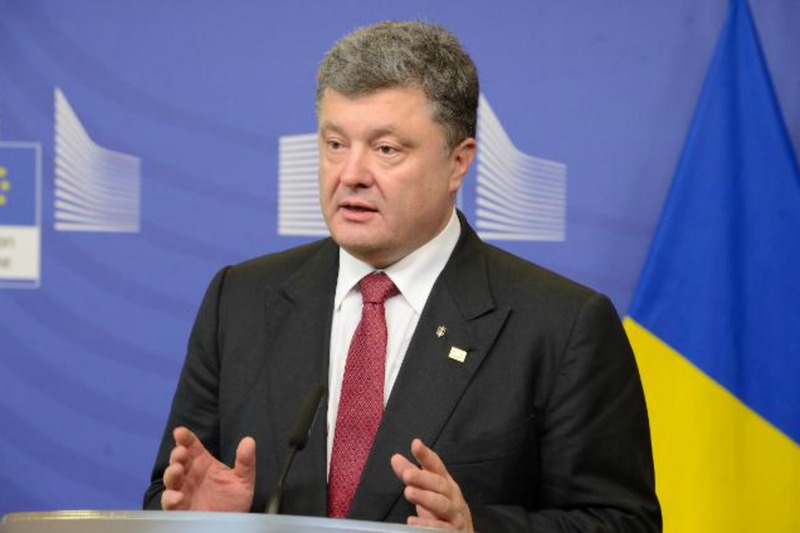 Poroshenko said that the EU’s agenda was now revolving around Ukraine. He mentioned Barroso’s visit in September, a visit by Van Rompuy and of Italian Prime Minister Mateo Renzi who holds the rotating EU presidency and of the President of the European Parliament Martin Schulz. All the visits were intended to demonstrate “that Ukraine has friends in those difficult times”. He said consultations about military and technical support and cooperation with many EU countries were due to take place on bilateral level and raise significantly the level of Ukraine’s defence. The issue of military assistance will be discussed on 4-5 September at the NATO summit in Cardiff, he said. EU leaders are far from speaking with one voice on the need for military assistance to Ukraine. A statement following the informal meeting of EU foreign ministers in Milan, held hours earlier, said, “there is no military solution” to the Ukraine crisis. But Lithuanian President Dalia Grybauskait? said at the summit that Russia is “at war with Ukraine and so effectively at war with Europe”, and openly called on Europe to supply Kyiv with military equipment. “We need to help Ukraine to […] defend its territory and its people and to help militarily, especially with the military materials to help Ukraine to defend itself because today Ukraine is fighting a war on behalf of all Europe,” Grybauskait? said. Poroshenko said on Saturday that EU leaders had agreed to prepare additional sanctions on Russia which would be conditional on the success of a peace plan proposed by him. “Based on my proposals, which were supported by the majority of the member states, there are possible sanctions that would be implemented – sectorial sanctions of the third level,” he said at the press conference after addressing the summit. “Third level” sanctions in diplomatic jargon refers to economic sanctions which are intended to hit the Russian major economic players, with unavoidable negative consequences also for EU businesses. Some EU countries have lost their appetite for further sanctions against Russia and reportedly insist that the Commission should make an assessment of the impact of current sanctions, before proposing new ones. Poroshenko added that a trilateral meeting on 1 September involving representatives of Kyiv, Moscow and the EU could produce a ceasefire. According to the summit Conclusions, the Commission is tasked to present new proposals for sanctions within a week. Each and every person and institution dealing with the separatists will be targeted. EU leaders spent most of their time at the summit discussing the sanctions issue. Russian President Vladimir Putin first used the term “Novorossiya” in official statements made on 29 August. Novorossiya, or New Russia, is a label for foreign territories which Russia covets. They could even extend to EU member countries. He also called the separatist fighters “militia forces”. Russian officials no longer deny that Russian military forces are active in Ukraine, but say they are there “on holiday”. EU diplomats said that Putin has built such a huge machine that he may be unable to stop it even if he wanted. Regarding possible peace plans for Eastern Ukraine, they said the biggest problem was securing the border, which most of the time is not even marked. Putin’s plans might be to destabilise Ukraine by setting up another “frozen conflict” similar to Transnistria in Moldova or to Abkhazia and South Ossetia in Georgia, but they may as well go much further, diplomats said. A United Nations report this week said more than 2,200 people had been killed so far, not including those who died when the Malaysian airliner was shot down. The sooner you kill each other off the better. Wipe out all of Europe and the USA in one big nuclear strike, and contaminate the land for the next 10,000 years. Dear Euractiv, unlike in Russia I know you’re loath to delete comments, because, unlike Mr Putin, you believe in freedom of speech. But, really, this call for the extermination of the peoples of Europe and the USA cannot remain if you want to consider yourselves a website with any decency. This post by “Jay” is disgusting. But what else could one expect from him/her/it. Of course, rather than add to the debate, this post only shows up the moral bankruptcy of Jay’s opinions. Has anyone figured out how Poroshenko made his billions or is that just another one of those inconvenient details best swept under the carpet? It’s all about wealth weather it’s Russia, EU, US, or China. Why is EU expanding eastward, why has the US surrounded the Mid East and allied with Europe via NATO? Why is Russia expanding eastward? Why does China threaten the Diaoyu/Senkaku Islands, South China Sea? The end game will be Russia/China vs EU/US. The tide has turned, separatists on the ground are winning, ordinary Ukrainians do not want to have anything to do with the meat grinder in E. Ukraine, there are anti-Poroshenko and anti-oligarchs demonstrations even in Kiev and W. Ukraine, Ukraine’s economy is de-industrialized and people do not get hot water. And winter is coming. While Yatzi talks about a 30% cut in gas use – under the best of circumstances. Lately we see some smaller EU countries seeking funding to build more expensive LNG facilities. How will the weakening European economy pay for these grandiose plans? The solution is obvious – more QE & lower interest rates – 100 billion/month in additional QE, cut EU funds to -1%, yes that is right, pay banks to borrow overnight funds. Putin won’t know what hit him. As for Ukraine – fracking of course. Great idea, they can entertain themselves with burning drinking water and earthquakes as they die of fracking fluid cancer. Then watch in envy as their fracked oil is shipped out to higher paying markets in Europe.